Cigarette smoking is one of the major cause for many of the lung diseases. Smoking is a practice of burning a dried plant and inhaling the smoke. It is one of most common form of recreational drug usage. People who smoke, get addicted to smoking which leads to gradual damage to the body. The substances that are inhaled causes reactions at the nerve endings in the central nervous system. These reactions are similar to that caused by the naturally occurring hormones, dopamine and endorphins, which are the main contributors of the sensation of pleasure known as ‘being high’. The level of being high can vary from mild stimulus (generally caused by nicotine) to intense euphoria (caused by heroin, cocaine). On combustion , active substances are released into the body through the inhalation of the smoke. These active substances are a mixture of aerosol particles and gases which mainly contain nicotine. This then gets absorbed into the blood stream. During cigarette burning, incomplete combustion occurs due to which carbon monoxide (CO) is produced which reduces the ability of blood to carry oxygen molecules. Cigarette smoke contains reactive oxygen species (ROS) and reactive nitrogen species (RNS) such as hydrogen peroxide, superoxide and hydroxyl radical, peroxynitrite(2). These species causes severe damage to alveolar epithelial cells. Smoking is the major cause to pulmonary emphysema, pulmonary fibrosis, COPD (Chronic obstructive pulmonary disease). 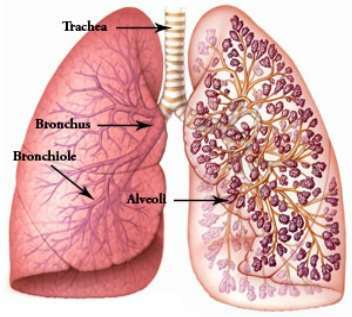 Pulmonary emphysema is the gradual damage of alveolar cells which progressively leads to short breath. It a type of COPD in which lung tissue is broken down with increasing an inflammatory response. Pulmonary fibrosis results due to the buildup of fibroblast in the small airways which eventually blocks the airway making it difficult to breath and causes eventual degradation of lung tissue due to less air supply. Smoking also increases the risk of lung cancer in an individual. The compounds inhaled during the smoking process have the tendency to alter the DNA of a person which can cause DNA alterations which can be passed onto the next generation of the smoker. The major part of the lungs that get affected by smoking is the alveoli. Alveoli are small balloon-like air sacs which act as the sites for gas exchange in the lungs. These sacs gets inflated and deflated during inhalation and exhalation. 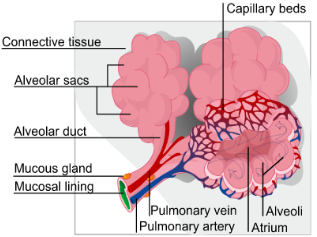 Alveoli are surrounded by a mesh of capillaries which bring carbon dioxide from rest of the body to exhale and absorb the oxygen that is inhaled. They are formed of epithelial cells and extracellular matrix. Some of them consist of Pores of Kohn which help in alveoli spacing. They are also composed of collagen and elastic fibers which help the alveoli cells to stretch in order to get filled up with air during inhalation and relax back to its original state during exhalation. Generally there are three type of alveolar cells : type I, type II and macrophages. Type I cells are generally composed of squamous cells and form the wall of the alveoli. Type II cells , also known as great alveolar cells, produce pulmonary surfactant that reduces the surface tension of the membrane and increases the capacity of gaseous exchange. Macrophages helps in attacking the foreign harmful materials. Type II cells plays a major role in the repair of lung tissue. They are known as the progenitors of Type I cells as they repair the endothelium of the alveoli when it gets damaged by moving to the denuded area (2,5,6) and proliferating into new cell Type II cells which can differentiate into Type I cells, thereby restoring the damage. Cigarette smoking has severe effects on these alveolar cells in the lungs which can lead to diseases like pulmonary emphysema, pulmonary fibrosis and lung cancer. 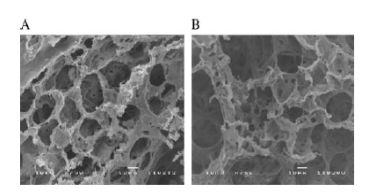 Due to cigarette smoking alterations are caused to the alveolar epithelial cells (Type I and Type II), which can increase the epithelial permeability, decrease the surfactant production of Type II cells, produce the cytokines and growth factors which causes inflammatory responses in the lungs. Also there is an increase in the cell death by either apoptosis or necrosis depending on the quantity of smoke components inhaled, which is because just active smoking is not harmful but passive smoking can also damage a person’s lung. Cigarette smoking has a number of adverse effects on the lungs. One of these effects in the generation of excessive oxidative stress. As mentioned earlier, cigarette smoke contains nearly 4000 different chemicals which are mainly carcinogenic (3). Among these major constituents are ROS (reactive oxygen species) and RNS( reactive nitrogen species) (2,3). A single puff of cigarette smoke contains 1017 oxidant molecules out of which 1014 are ROS such as nitrogen oxide and superoxide radical which when in the lungs, reacts immediately to form reactive peroxynitrite. Also the smoke contains hydroquinones which after redox cycle forms superoxide radical and hydrogen peroxide. This hydrogen peroxide and hydroquinones can enter the cell’s nucleus and can cause oxidative DNA damage. Another factor contributing to the oxidative stress is the production of iron from ferritin which can trigger the phagocytes to release ROS (2). It also reduces the levels of anti-oxidants in the blood. Cigarette smoke contains both gaseous and particle (tar) components which sensitively affect the Type II alveolar cells. Severe destruction to these cells lead to pulmonary emphysema. The hydroxyl radical released during smoking activates poly(ADP-ribose) polymers (PARP), a DNA repair enzyme, which causes in decreased levels of nicotinamide adenine dinucleotide (NAD) altering the ATP synthesis leading to cell death (4). The bronchial epithelial cells reacts to cigarette smoke by producing xanthine and hypoxanthine, which damages the genetic information of the cells(2). The damages caused eventually leads to cell death by either apoptosis or necrosis, which depends on the magnitude of smoke inhaled. A recent study showed that at low levels of aqueous cigarette extracts, cells undergo apoptosis and at high levels they die by necrosis. These cell deaths are caused due to the effect of ROS on them. The in vitro test of cell apoptosis was supported by in vivo study on rats which were exposed to cigarette smoke for approximately 100 days and showed bronchial epithelial cell death. 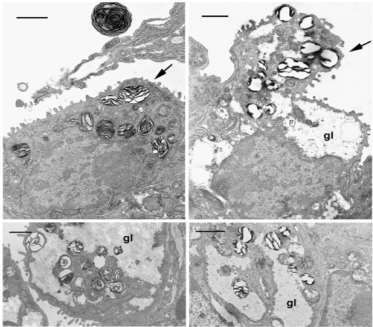 Chronic inhibition of the vascular endothelial growth factor receptor induced apoptosis in alveolar endothelial cells, followed by pulmonary emphysema (fig 3). 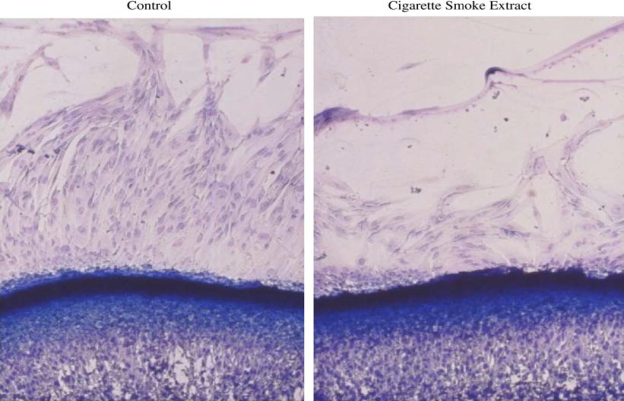 Exposure to smoke can also induce stress-induced senescence which prevents epithelial cell proliferation. Thus, cigarette smoke not only by induces epithelial cell death, but also inhibits epithelial repair processes. Studies have shown that cigarette smoking can cause the enlargement of alveolar spaces and increase the epithelial permeability which can also lead to diseases like hypoxia, emphysema, COPD. For small damages in the lung, the lung tissue undergoes various repair mechanisms such as: chemotaxis, proliferation, production of extracellular matrix, remodeling of extracellular matrix and DNA repair mechanisms. Studies indicate that smoking cigarettes can inhibit these repair mechanisms in the lung tissue. Most of the repair mechanisms are carried out by the Type II alveoli cells, Pores of Kohn and mesenchymal cells. Type II cells generally repair the damaged Type I cells by migrating to the affected area, proliferating to new Type II cells and then act as a progenitor cell for the production of Type I cells. The alveolar wall have holes that could provide channels between adjacent alveoli which are known as Pores of Kohn. These are traditionally known as pathways for collateral ventilation, but due to the small size, they are occluded with surfactant which probably precludes them from functioning in this capacity. These Pores of Kohn represent injuries that might have been repaired. They equalize pressure in adjacent alveoli cells and thereby helps to prevent the collapse of lung (7,9). Mesenchymal cells also plays crucial role in the repair of lung tissue. These cells send signals which initiate development and maintenance of lung branching. Also alveolar mesenchymal cells store and release retinoic acid which are responsible for the formation of secondary septation. These cells are the major contributors of the extracellular matrix macromolecules. In-vitro bioassay models have been made to understand the repair mechanism of mesenchymal cells. Fibroblasts, type of mesenchymal cell, produces the extracellular macromolecule fibronectin which mediates the interaction between cells and extracellular matrix. In-vitro models of mesenchymal cells are developed by culturing fibroblast/myofibroblast in three-dimensional collagen gels which shows their ability to contract (8,11). This ability of fibroblast is inhibited by the components of cigarette smoke causing them to lose their ability to heal wounds by contracting the affected area. Smoke also affects the enzyme lysyl oxidase which is involved in the maturization and repair of elastic fibers which affects the polymerization and production of elastin. Emphysema is also exacerbated by starvation, shortage of oxygen supply, which is followed by intratracheal elastase infusion (12). Studies were conducted on mouse that indicate that T-cell–derived factors drive lung cell apoptosis which play a major role in starvation-induced emphysema (10). It has been made evident that smoke promotes starvation and inhibits the refeeding ability (counter action of the cells to starvation) and thereby worsen emphysema. Studies have shown that smoke inhibits airway epithelial cell chemotaxis and proliferation(14,13). When alveolar epithelial cells are cultured on collagen gel, gel contraction happens suggesting epithelial cells participate in closure of alveolar cells but smoke inhibits this mechanism(shown in figure 5). COPD not only causes emphysema but also develop peribronchiolar fibrosis. It is developed in small bronchiolar airways and is characterized by the deposition of fibroblast and myofibroblast together with extracellular matrix to produce fibrillar collagen. This collagen contracts and narrows the small airways. This fibroblast contraction was studied by Wang and colleagues (16) by evaluating the effect of smoke on three-dimensional collagen gels as a function of cell-density. Cigarette smoke inhibited contraction of three-dimensional collagen gels at low density of fibroblast. At a higher density, collagen gel contraction is stimulated by smoke. Wang and colleagues showed that, at increased density of fibroblast, latent transforming growth factor (TGF)-β is activated (fig 6). This activated TGF-β contracts the three-dimensional collagen gel by stimulation of fibroblast. This regulation of the tissue damage is carried out through the paracrine mechanisms(1). As described earlier smoking can also affect DNA, as a result acquired genetic abnormalities are also developed. Cancer caused by cigarette smoking is also believed to be developed by somatic cell mutations. These mutations can also cause COPD. Cigarette smoke has the ability to damage DNA by several mechanisms (15) which can inhibit apoptosis (13, 17) which protects from unwanted, genome altered cell growth. As a result DNA repair gets initiated which leads to cell recovery and subsequent proliferation. This could lead to the accumulation of cells that have altered gene function and causes impaired repair responses within the lung of smokers . Different strategies are developed to restore repair mechanism in the lung tissue. Studies on adult rats demonstrate that all-trans-retinoic acid can induce new alveolar wall formation (18,19). But limited studies on human volunteers has demonstrated safety but no alveolar repair. It can be concluded that different direct and indirect repair mechanisms are altered by cigarette smoking. The progression of diseases caused by lung tissue damage can be slowed by understanding and creating novel techniques which can target the repair responses in the lung. 1) Rennard SI, Togo S and Olaf Holz. Cigarette Smoke Inhibits Alveolar Repair: A Mechanism for the Development of Emphysema. Proceedings of the american thoracic society 2006. Vol 3, 703-708. 2) Aoshiba K, Nagai A. Oxidative Stress, Cell Death, and Other Damage to Alveolar Epithelial Cells Induced by Cigarette Smoke. Tobacco Induced Diseases Vol. 1, No. 3: 219-226 (2003). 3) Church DF, Pryor WA. Free-radical chemistry of cigarette smoke and its toxicological implications. Environ Health Perspect 1985;64:111-126. 4) Kamp DW, Srinivasan M, Weitzman SA. Cigarette smoke and asbestos activate poly-ADP-ribose polymerase in alveolar epithelial cells. J Invest Med 2001;49:68-76. 5) Mason RJ, Shannon JM. Alveolar type II cells. The Lung:Scientific Foundations Second Edition edited by Crystal RG, West JB, Weibel ER, Barnes PJ. Lippincott-Raven, Philadelphia. 1997:543-555. 6) Uhal BD. Cell cycle kinetics in the alveolar epithelium. Am J Physiol 1997; 272:L1031-1045. 7) Wright JL. The importance of ultramicroscopic emphysema in cigarette smoke-induced lung disease. Lung2001;179:71–81. 8) Bell E, Ivarsson B, Merrill C. Production of a tissue-like structure by contraction of collagen lattices by human fibroblasts of different proliferative potential in vitro. Proc Natl Acad Sci USA 1979;76:1274–1278. 9) Lu DF, Stanley C, Nunez G, Frazer D. A mathematical description of pressures in alveolar pores of Kohn. J Biomech Eng 1991;113:104–107. 10) Massaro D, Massaro GD, Baras A, Hoffman EP, Clerch LB. Calorierelated rapid onset of alveolar loss, regeneration, and changes in mouse lung gene expression. Am J Physiol Lung Cell Mol Physiol 2004;286: L896–L906. 11) Grinnell F. Fibroblast biology in three-dimensional collagen matrices. Trends Cell Biol 2003;13:264–269. 12) Sahebjami H, Vassallo CL. Influence of starvation on enzyme-induced emphysema. J Appl Physiol 1980;48:284–288. 13) Liu X, Conner H, Kobayashi T, Kim H, Wen F, Abe S, Fang Q, Wang X, Hashimoto M, Bitterman P, et al. Cigarette smoke extract induces DNA damage but not apoptosis in human bronchial epithelial cells. Am J Respir Cell Mol Biol2005;33:121–129. 14) Cantral DE, Sisson JH, Veys T, Rennard SI, Spurzem JR. Effects of cigarette smoke extract on bovine bronchial epithelial cell attachment and migration. Am J Physiol 1995;268:L723–L728. 15) Rennard SI, Hepp L. Cigarette smoke induced disease. In: Stockley, RA, editor. Chronic obstructive pulmonary disease Oxford, U.K.: Blackwell. 16) Wang H, Liu X, Umino T, Kohyama T, Zhu YK, Wen FQ, Spurzem JR, Romberger DJ, Kim HJ, Rennard SI. 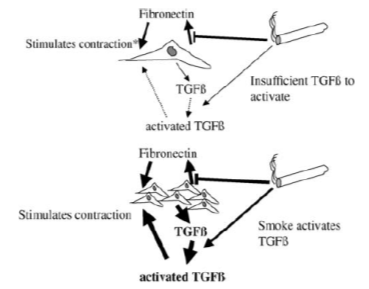 Effect of cigarette smoke on fibroblast-mediated gel contraction is dependent on cell density. Am J Physiol Lung Cell Mol Physiol 2003;284:L205–L213. 17) Kim HJ, Liu XD, Kobayashi T, Conner H, Wen FQ, Kohyama T, Fang QH, Abe S, Bitterman PB, Rennard SI. Cigarette smoke induces reversible DNA damage in human fetal lung fibroblast cultured in three-dimensional collagen gels. Am J Respir Crit Care Med 2003;167: A489. 18) Belloni PN, Garvin L, Mao CP, Bailey-Healy I, Leaffer D. Effects of all-trans-retinoic acid in promoting alveolar repair. Chest 2000;117: 235S–241S. 19) Hind M, Maden M. Retinoic acid induces alveolar regeneration in the adult mouse lung. Eur Respir J 2004;23:20–27.